Created for radio in 1938, the patriotic aviator ran the Secret Squadron, what we today would call a "black ops" team, supported by the government, but functioning outside of cumbersome legalities in dealing with spies, saboteurs, and (after the war) criminals and interplanetary aliens! Trivia note: the Secret Squadron originally used the code "SS" on their messages, decoders, and uniform patches, but changed it to "SQ" after World War II began to avoid reference to the notorious Nazi SS stormtroopers! The show ran Monday thru Friday in 15-minute segments, with ongoing storylines running for several months at a time, ending each episode with a cliffhanger and a coded message which required a Captain Midnight Decoder to translate. A series of Big Little Books, a newspaper comic strip, and two different comic book series quickly followed, as well as a 15-chapter movie serial. The radio show ended with a bang in 1949, as Cap's archenemy Ivan Shark (an evil aviator) was killed in the final episode! Talk about "closure"! Ovaltine revived Cap (but not Ivan Shark) in 1954 as a weekly tv series with a heavier science fiction emphasis. The Captain was now a civilian adventurer operating out of a mountaintop base in the SouthWest US, battling criminals and the occasional Communist spy. 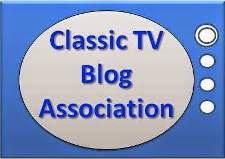 Though only 39 episodes were produced, the show reran continuously in syndication until the mid 1960s. Trivia note: the syndicated version was retitled Jet Jackson: Flying Commando because Ovaltine owned the "Captain Midnight" trademark and didn't sponsor the reruns! Ovaltine continued to use "Captain Midnight" on advertising and occasional tie-in premiums until the late 1990s, when they finally abandoned the trademark. Since then, he's only been around as part of old radio show collections on cd or mp3...until now! Recently, both Moonstone Books and Dark Horse Comics revived Captain Midnight in NEW comics and prose stories! Besides his own series, he's also part of a team of other Golden Age aviator-heroes called the Air Fighters! Captain Midnight's already been part of our collection with six different vintage designs including five classic covers and his stylish logo on a variety of items including t-shirts, hoodies, mugs, messenger bags, and other tchochkes, for almost two years! 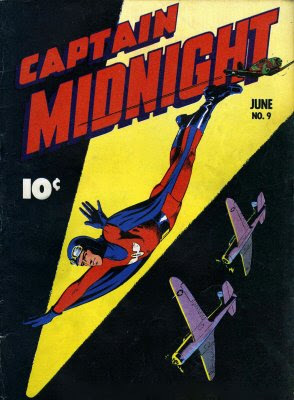 In addition, we now have both a Captain Midnight 2014 12-Month Calendar with a dozen dynamic classic comic covers, including the first issue of his 1940s title (featuring the Golden Age Captain Marvel welcoming him), AND an Aviators of the Golden Age of Comics 2014 12-Month Calendar which features Cap AND a number of other Air Fighters characters! As unique Xmas gifts for collectors of pop culture kitch, you can't go wrong with one of these klassy and kool kollectibles as a stocking stuffer! For something REALLY special, why not combine one of our Captain Midnight collectibles with one of Moonstone or Dark Horse's new Captain Midnight books (available at your local comic shop) as a gift set? Our FREE Early Christmas Present to you: downloadable mp3s of the Captain Midnight radio show! BONUS FREE Early Christmas Present: downloadable episode of the Captain Midnight tv show!